Social Engineering is act of manipulating the person o accomplish goals that may or may not be in the “target’s” best interest.This may include obtaining information, gaining access, or getting the target to take certain action. 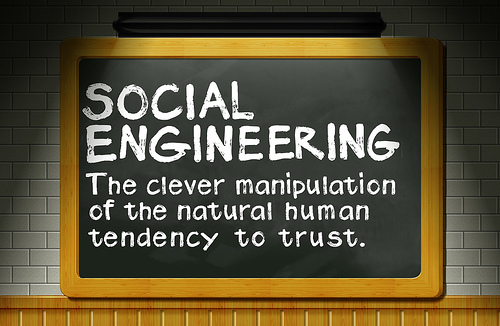 Social engineering" as an act of psychological manipulation was popularized by hacker-turned-consultant Kevin Mitnick. The term had previously been associated with the social sciences, but its usage has caught on among computer professionals. The picture that emerged after his arrest in Raleigh, N.C. last February was of a 31-year old computer programmer, who had been given a number of chances to get his life together but each time was seduced back to the dark side of the computer world. Kevin David Mitnick reached adolescence in suburban Los Angeles in the late 1970s, the same time the personal computer industry was exploding beyond its hobbyist roots. His parents were divorced, and in a lower-middle-class environment that lacked adventure and in which he was largely a loner and an underachiever, he was seduced by the power he could gain over the telephone network. The underground culture of phone phreaks had already flourished for more than a decade, but it was now in the middle of a transition from the analog to the digital world. Using a personal computer and modem it became possible to commandeer a phone company's digital central office switch by dialing in remotely, and Kevin became adept at doing so. Mastery of a local telephone company switch offered more than just free calls: It opened a window into the lives of other people to eavesdrop on the rich and powerful, or on his own enemies. How To Use Social Engineering Tool Kit ?